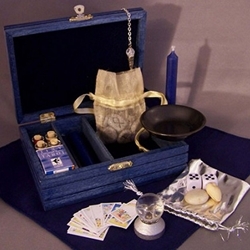 Divination is used for divining what may come in the future. Are you on the right path to reach your goals? Step inside to see if you can see. Here you will find Tarot Decks, Oracle Decks, Rune Sets, Pendulms, and Scrying Bowls and Mirrors. Crysstal Balls are perhaps the best known image of divination. They are really used as a form of scrying and are deeply connected to the earth as we use Her orbs to try to see what may come. While Tarot Decks, Crystal Balls, Runes, Pendulums, and similar scrying devices are the most commonly known methods for finding answers through spiritual and magical means, there exists a great many other options that have been created and explored. Oracle card decks claim to provide insight and positive outlooks to people. Modern oracle cards are conceptually similar to divinatory tarot cards, but they are often not divided into playing card suits. They often lack what is often seen as the "darker" images of traditional tarot cards. Whether you're exploring the art of pendulum dowsing for the first time or have been using it in your divinations to find answers for some time, we have everything you need. From copper and stainless steel to crystal points and precious stones, you can find Pendulums of all shapes and sizes right here. Our extensive collection of Runes provides you with a variety of Runes for whatever purpose you can imagine. We offer Norse, Elder Futhark and Witches runes on everything from bone and amethyst to quartz and glass, allowing you to cast your runes in divination or otherwise use them in your ritual magic. The Tarot has been in use for thousands of years by people the world over for divination as well as a teaching tool to explore the meanings of life and the lessons we are on this planet to learn. Step inside to find all you will need to begin The Fool's journey.